When we moved into our new house last July I couldn’t wait to get started decorating. Then I panicked and just sat staring at walls trying to figure out how to it. Oh, and I realized that my budget was tiny to say the least. So, I’ve been doing one little thing at a time slowly collecting the bits and pieces and planning for the big stuff that will come much later. 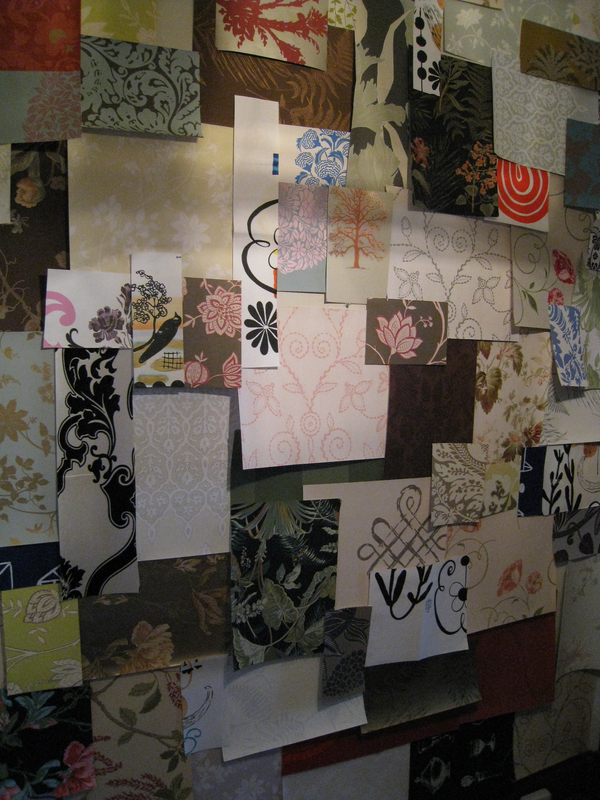 Then I got this crazy idea to do a wallpaper collage in my entry way. I thought it was an amazing idea that could either turn out great or totally awful. I took it to my super creative kindred spirits, Margot Madison and April Combs to find out if they thought it was crazy too. They didn’t hesitate, their answer was a resounding “you must do this” and they even offered to help! 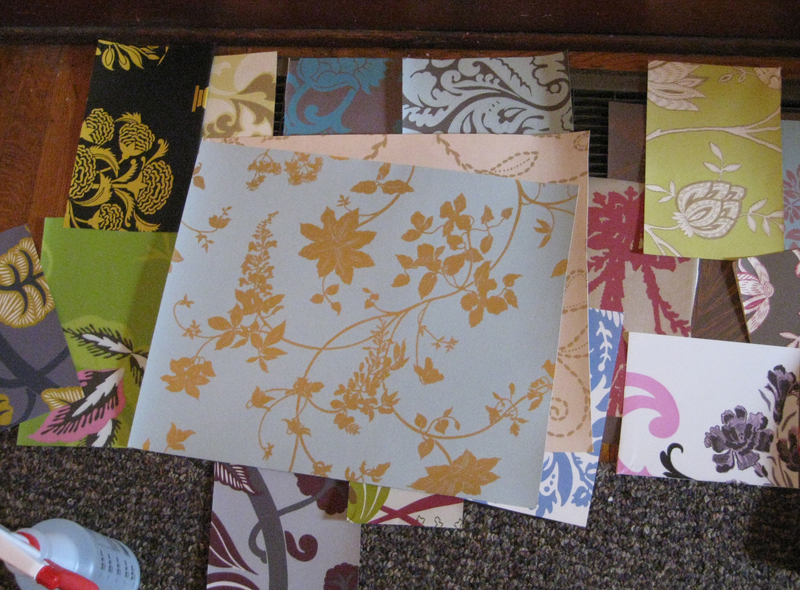 So I spent the next few months collecting wall paper samples from friends and ebay. 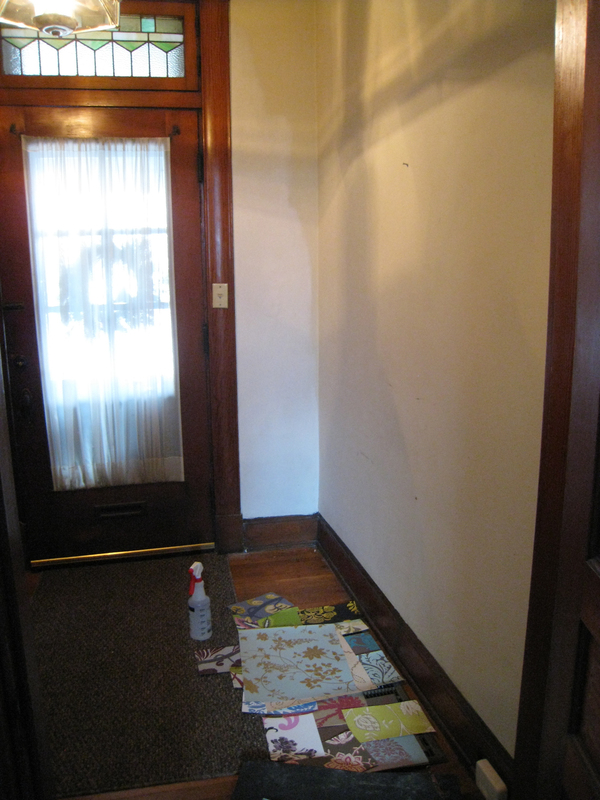 The wall I chose to cover is just inside my main entrance at the bottom of the stairs. Note the horrible off white color that our entire house is still painted in…ugh. I never could have done this without help; I tried putting up a few pieces before everyone got here but the pressure to get it right was overwhelming. Margot stepped in and just went for it! 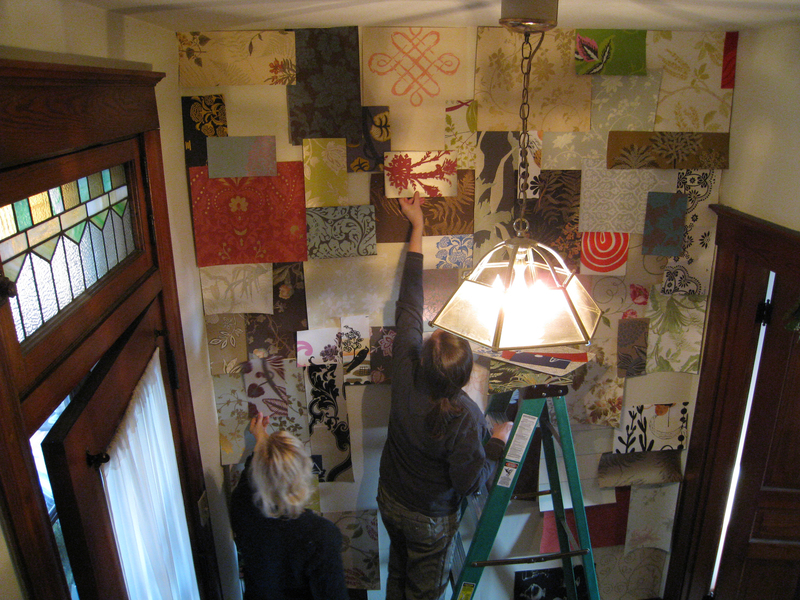 We started by putting up a few of our favorites first. As soon as the first dozen or so pieces were up I knew it was going to be even better than I had imagined. Ignore the hideous hanging light fixture, it’s not long for this world. I panicked a little when it came time to paste it all in place. 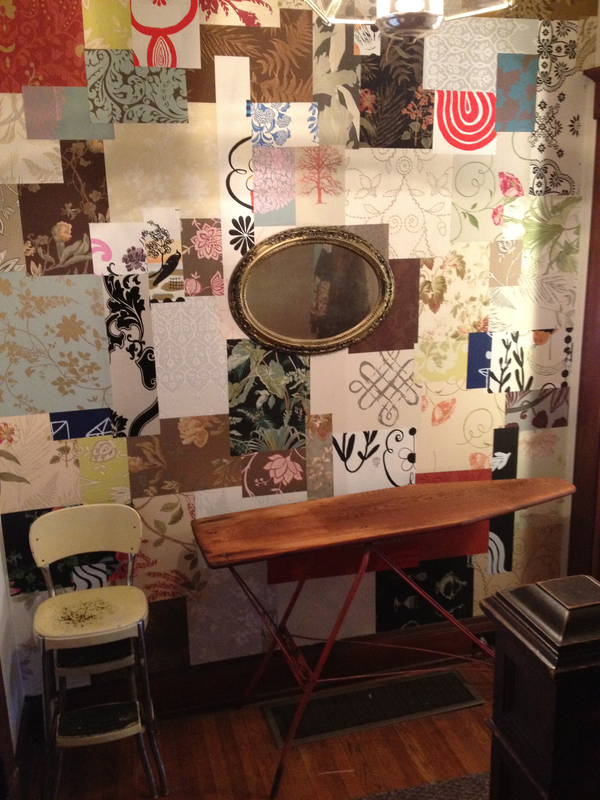 I took tons of photographs then took down the pieces one small section at a time. 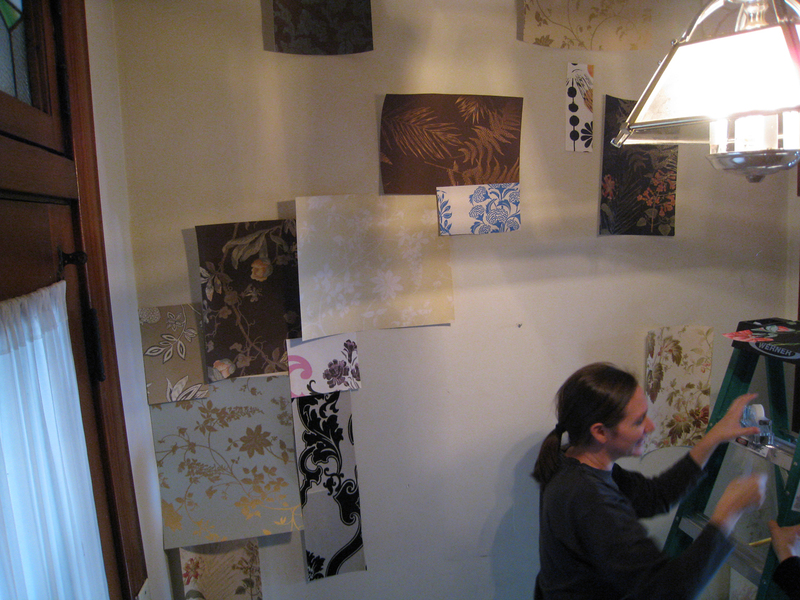 I used a roll-on wallpaper adhesive and a small roller to apply it to the back of each piece. The paper bubbled up a lot and I was resigned to live with the lumps but Margot was right and the next morning they had smoothed out almost entirely. It took me 2 gruelling days to paste all of the pieces and I think I got most of them back in the right spots. My vintage mirror and step stool fit perfectly, and my husband refinished this old ironing board for me to use as a key table. This is now my favorite wall in the whole house. I especially love the way portions of it can be seen from the other rooms in the house and as you come down the stairs. And the whole thing cost less than $50. It looks awesome. Thank goodness for adventuresome friends!